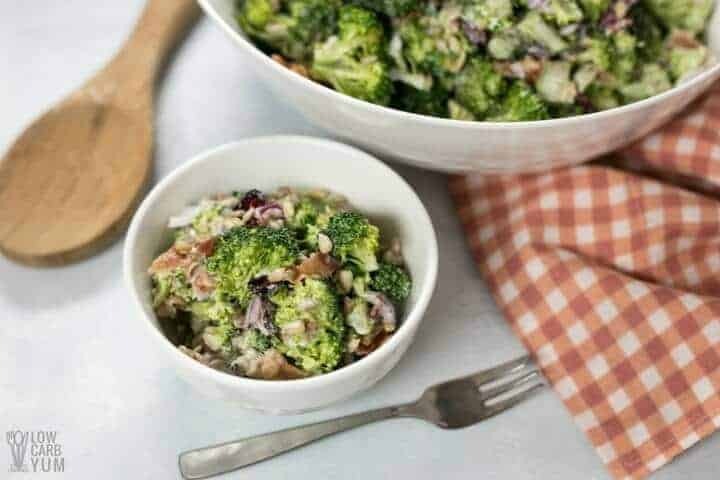 A classic sweet broccoli salad with crispy bacon and chewy unsweetened dried cranberries. 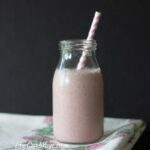 It’s low carb and paleo friendly with no added sugar. 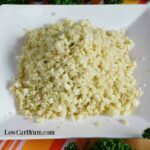 I’m always looking for ways to lower the carbs for recipes that I enjoyed before going low carb. 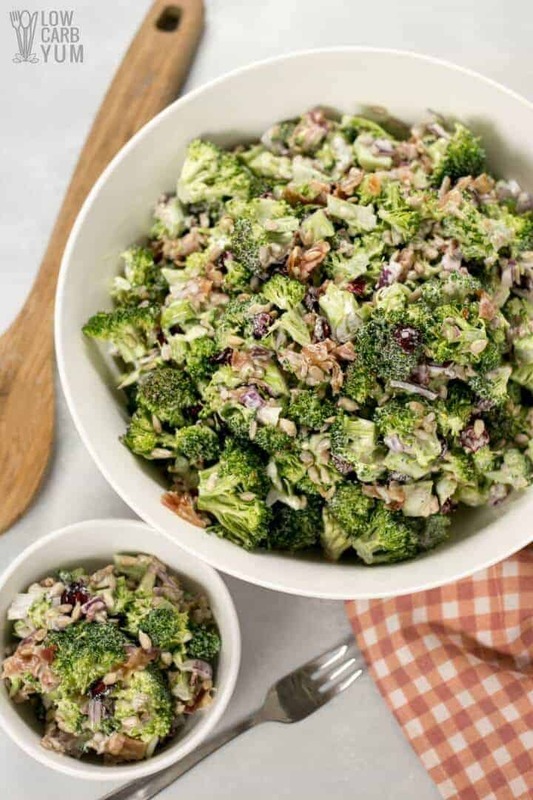 One of the dishes that’s often served at family gatherings in the summer is broccoli salad. 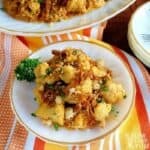 Although there are several different versions, I prefer the one with sweet dressing, crunchy bacon, and chewy cranberries. It’s similar to the salad I posted here, but this one has unsweetened dried cranberries and no cheese. Sunflower seeds and cranberries have about the same amount of carbs per volume. So, you can sub one for the other in this sweet broccoli salad if you wish. 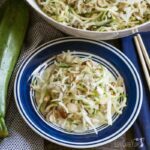 But, the sunflower seeds do add in some healthy fat. I like to use the same amount of each in the salad, but if you like cranberries add more and less sunflower seeds. You can also reduce or omit the onion. However, it doesn’t add many carbs per serving. I used a chopped red onion, but it’s totally optional. 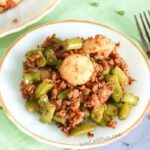 It adds color and flavor without adding a lot of carbs so it’s worth the minimal carbs added. 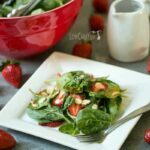 To sweeten the dressing in this sweet broccoli salad, I used a blend of stevia concentrated powder and monk fruit concentrated powder. But, you can certainly use any low carb sweetener you prefer. I’ve moved away from erythritol based sweeteners for a few reasons. One is that it typically comes from corn so it may contain trace amounts and I’m sensitive to corn products. Another is that I’m very sensitive to it when it passes in urine as it has a similar “cooling effect” because it doesn’t get digested and passes relatively unchanged. I also like that concentrated sweeteners like stevia and monk fruit are completely carb free without any sugar alcohols. 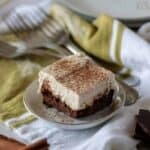 There are some recipes that are difficult to make without the bulk of erythritol like frosting. So, I do still use bulk sweeteners like Swerve on occasion. 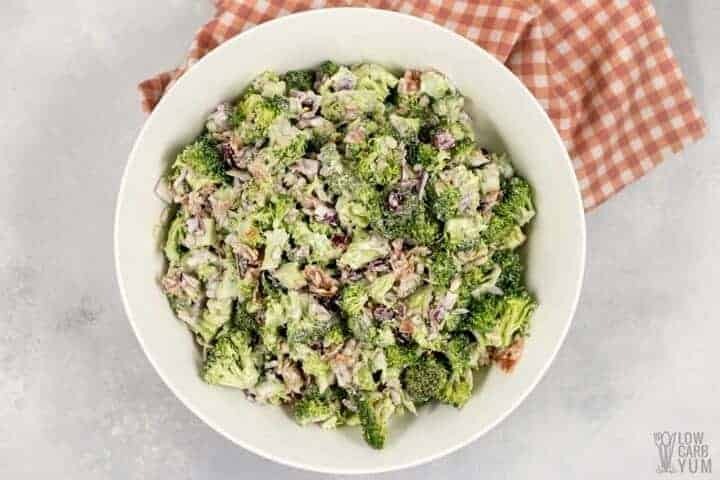 I served this sweet broccoli salad to the guests at our Fourth of July cookout. There were only a few low carbers at the picnic, but the salad was enjoyed by all. I’ll definitely be making the salad again this summer. It’s one of my favorites and it’s great for packing in a cooler for lunch at work. It’s pretty filling so it can be a meal in itself. I got about nine cups of salad from the recipe so I figured about one cup servings. Most people won’t take a full cup if it’s a large cookout with tons of food. 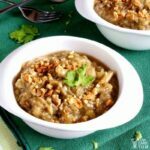 You can easily get twice as many servings as stated as it fills up a medium bowl. But, you can adjust the recipe as needed to serve more or less people. 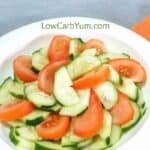 This salad is one of many low carb side dishes perfect for picnics and BBQs. And, it’s super quick to prepare. From start to finish, it shouldn’t take longer than ten minutes. I like to use broccoli florets that are already washed to save time. But, it shouldn’t take a lot of time to wash and cut a bunch of broccoli. 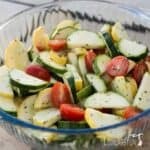 I hope you enjoy this fantastic summer salad as much as I do. Do you have a favorite variation of broccoli salad? 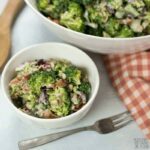 A classic broccoli salad with crispy bacon and unsweetened dried cranberries. It's low carb and paleo friendly with no added sugar. 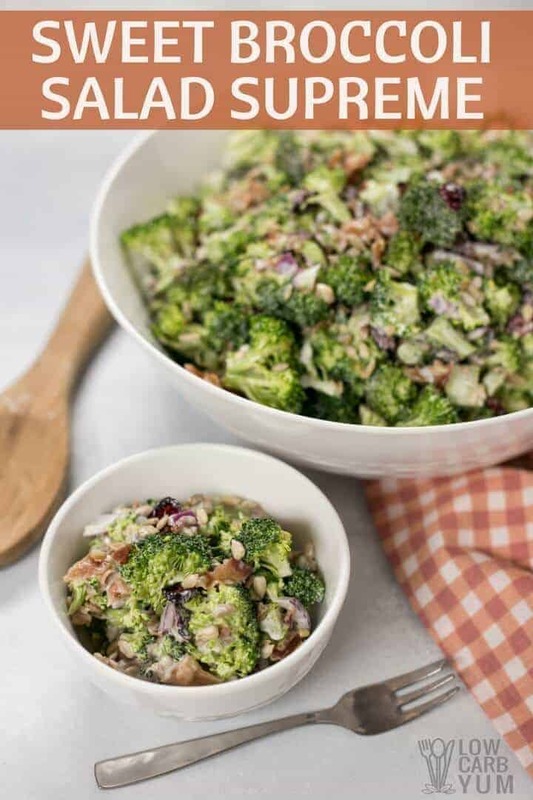 Combine broccoli, bacon, sunflower seeds, dried cranberries, and onion (if using) in a large bowl. In a small bowl, whisk together avocado mayonnaise, stevia, monk fruit, and vinegar. 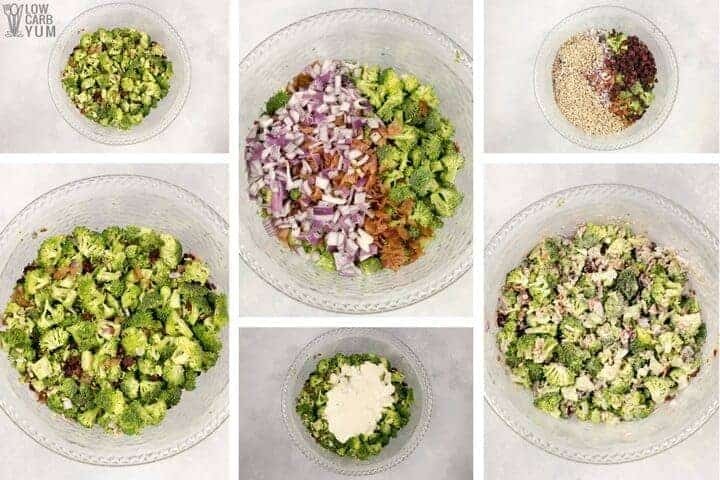 Stir mayonnaise based dressing into broccoli mix. Chill several hours before serving.